Thai villages have always some kind of Spirit Medium, bonesetter, Psychic Medium helping local villagers. Spirit can be called "Poo" (ปู่) or grandfather. Believers are called children (ลูก). The Spirit Medium is able to make sacred water with mystical properties. Believers are seating in a row with their legs straight. Consecrated water is poured on head and body. Spirit knowledge is still strong in Thailand. It is severely fought by some Buddhist monks. When leaving the village for a long trip and coming back to the village, it is preferable to come to pay respect to the spirit. 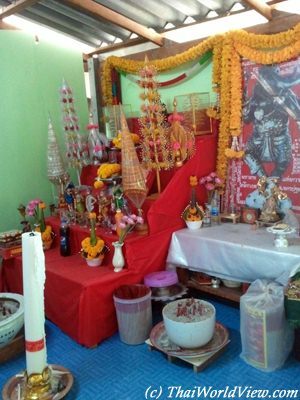 Some people argue that spirit belief is linked to people's lack of education in Thailand. During the decade 1960s, when a Thai horror movie was shown in theaters, the owner has to pay respect to the spirit in order to avoid problems. 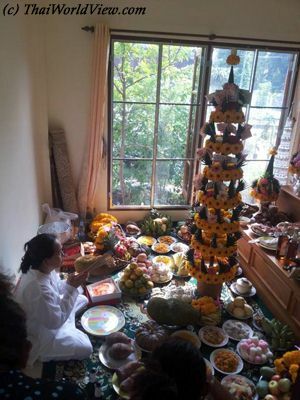 Once a year, a ritual (ยกครู) is celebrated with abundant offering including food (chicken, fruits, alcohol, coconut...). This ritual allows the spirit medium to honor and reconfirm relationship with his spirit. Spirit belief is often seen as superstition in our modern world. The Spirit Medium is able to connect with the spirits and to be possessed temporarily. It can then give advices and be able to see the future. Once the trance session is over, the spirit medium always forgets what he said. 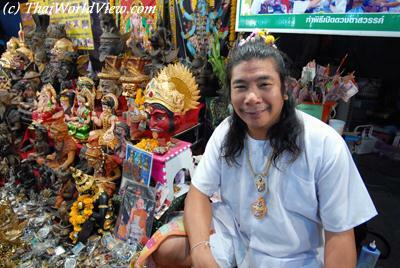 Such spirit medium (คนทรงเจ้า) can have other names such as bonesetter, Psychic Medium or healer. The Spirit Medium, when entering in trance, then becomes the channeller of spirit. When in trance, the healer can have a complete different voice and behavior. He can even shake if possessed by an old spirit. 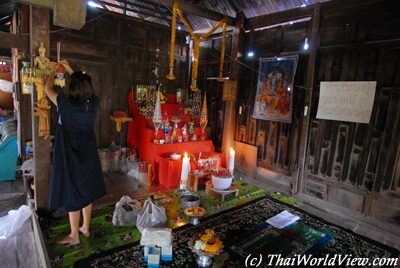 Such behavior is often seen as violation of Buddhist teachings but in Thailand, Animism and Buddhism always live together since ages. The channeller of spirit is often a middle age woman wearing white clothes. She has to take a bath before the possession and cannot perform such duties during her periods. 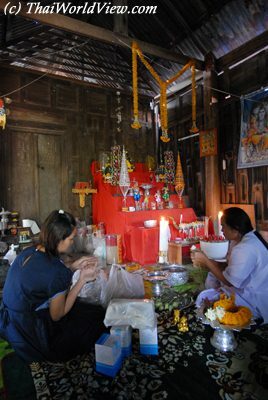 She is normally of high morality so she does not perform on holy days or does not perform bad things such as supporting a woman (เมียน้อย) to steal another woman's (เมียกลาง) husband (white magic against black magic). Thai people often say "Mai Cheua Yaa lop luu" (ไม่เชื่ออย่าลบหลู่). If you don't believe, then don't show disrespect! For many Thai people, such services are seen as a psychologic assurance and comfort towards future in a difficult modern world. The Spirit Medium can lead a large group of followers and provide various advices related to health, family and business. 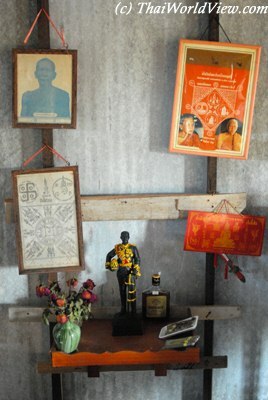 Some spirit mediums can be possessed by famous spirits (เทวดา, King Rama V...) or more simple local spirits (ผี or ปู่). Several medium spirits claim to be possessed by King Rama V!! 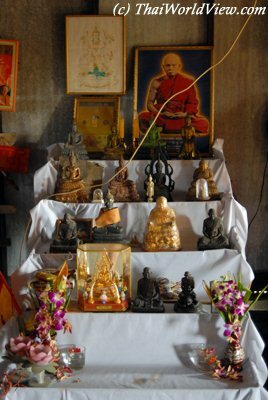 Since decades, Buddhism has faced many crisis such as commercialisation, moral decline (crime, corruption, drugs, monks behavior) happening in local Buddhist temples. Due to rapid industrialisation and changes in the Thai society during decades 1970s to 1980s, a big increase of home-based professional spirit mediums happened. In 1990s it was estimated that 100 000 mediums were established in Thailand. Before requesting anything from the spirit, incense and candles shall be lit. 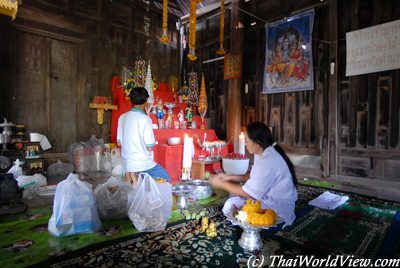 Once the spirit has given an advice, the commoner can give a donation (ค่ายกครู) or a future reward (แก้บน) if the wish is performed. The surge in urban-based spirit-medium is due to people moving from countryside to cities. 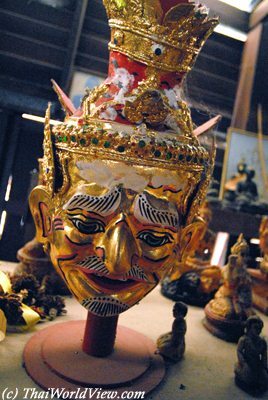 Those deities and spirits also act as protectors and sponsors of Buddhism. 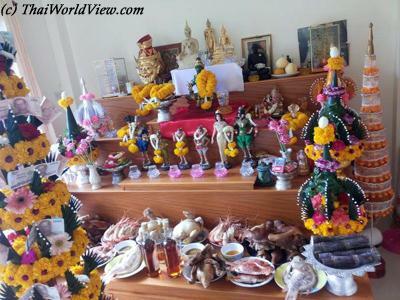 This home-based altar features some local deities and spirits such as Kinaree, Nang Kwak, Reusi or Kuman Thong. 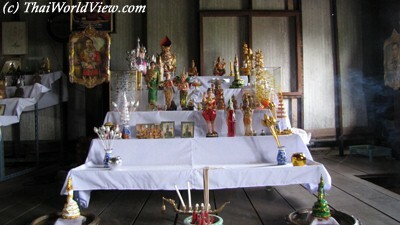 Those two altars located into a specific room show religion syncretism in Thailand. 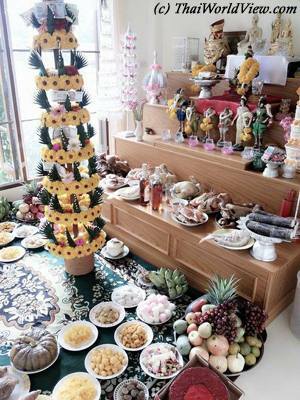 This home-based altar features numerous Buddha images and famous monks statues. 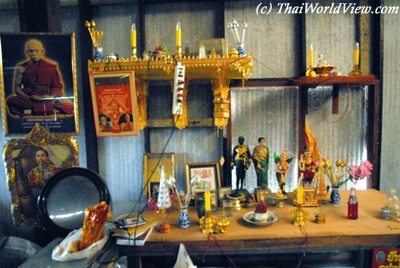 This small altar features King Rama V. Some royal spirits such as former Thai kings are often worshipped. Spirit Medium often have posters featuring Indian deities. 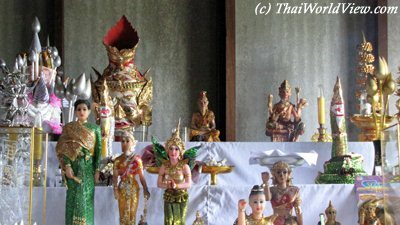 Brahma, Vishnu and Indra are designated as deities or angels (Thewada - เทวดา). 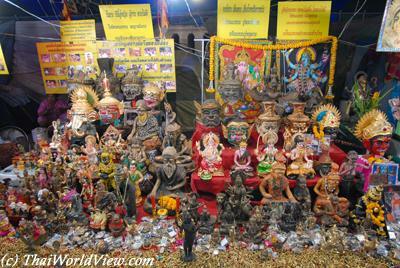 Popularity of of major hindu deities (Brahma, Siva, Ganesh...) is important. 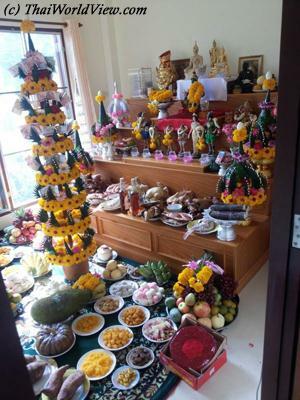 This is due to Hindu community presence in Thailand and to the fact that some deities were also revered during Royal rituals. Thai movie (คนทรงเจ้า) was released in year 1989. It is worth to be seen by those interested in Spirit Mediums in Thailand. The Culture Ministry registers 25 Thai classic films each year at the National Film Heritage Registry. This movie is part of the 25 films heritage list announced on 04 October 2014, which is Thai Movies Conservation Day.